Vacationing abroad travelling to international destinations needs lot of planning, preparations and Foreign Exchange hassels. Find out the multiple options available to carry money abroad. Vacationing abroad or simply travelling to international destinations needs lot of planning and preparations. Hotel booking, airline tickets and the most important: how to carry money while travelling abroad. Till few years' back international credit and debit cards were the options for transactions abroad; but there are multiple options available now: ranging from prepaid travel cards to international mobile wallets. Carrying cash and exchanging it at the airports and hotels might not be a great idea as foreign exchange rates at the airport and hotels are the highest, but it's often good to get some foreign currency before you leave for the journey so that you have cash on hand for your immediate expenses like buying a meal at the airport or taking a cab to your hotel, keeping in mind that carrying cash is the risky way to carry money. But technology always enables faster and user-friendly provisions to make our overseas travel delightful. Payments through wallets can also be made for cab rides abroad in Indian currency, Paytm wallets soon to enable the same for using Uber rides in foreign land. With Travellers' cheque, finding Money Changers and en-cashing it may create a lot of trouble and they are not even widely accepted. Using debit or credit cards when travelling abroad may get you into unnecessary interest rates, and with the currency fluctuations it can be a lot of extra money. Whereas prepaid travel cards saves from all that extra charges and gives a hassle free experience. Prepaid travel cards is said to be the most inexpensive as well as convenient way to carry money abroad. A lot of banks such as Axis Bank, HDFC Bank, ICICI Bank, etc along with non-bankers like BookMyForex, UAE Exchange and Thomas Cook etc. offer these cards. Mr. V George Antony, MD - UAE Exchange India, says "It's best to carry prepaid forex travel card instead of carrying high-volume currencies. It's safer, economical, user-friendly and convenient for all users." Prepaid forex card is the safest and cheapest way to carry money abroad and widely used across the world. It is loaded with funds at the time of purchasing the card. While issuing the card some organizations might charge a nominal fee while others gives it for free even without any processing fee. 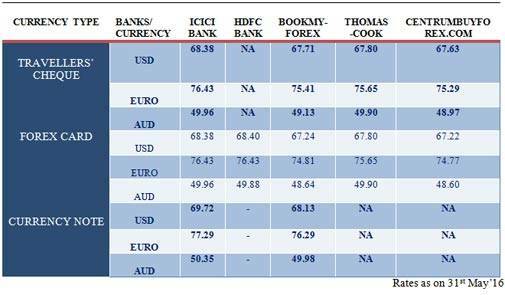 Normally, the rate at which one buys forex would be marginally more than the IBR rate to manage the operating cost. Some of these Prepaid Travel Cards are also multicurrency cards. In this product multiple currencies can be loaded in the same card thus multiple cards for different destinations is not required, specially designed for those who goes abroad regularly or for people visiting different countries in one trip. "Forex pre-card is taking the dominant position especially amongst corporate / frequent travellers who have used and found plastic currency extremely easy and full of options and functionalities." says Sudarshan Motwani, CEO BookMyForex. Forex card is used widely and it's getting popular because of the rate it offers. This plastic card provides the cheapest rates among all the other various options available. With prepaid travel card you can get preferential exchange rates and avoid foreign exchange fluctuations; some of the providers such as BookMyForex even offer rate alert system to get a better rate and freeze it, and can lock in the exchange rate before the trip. This way one has full control over the rate at which the foreign currency is loaded in their forex travel cards. "Customers can book through online or make request through online and block rates, collect the currency or travel card across the country from their convenient location" adds Antony. This card can be used for all type of foreign transactions; buying air ticket, at merchant outlets or for cash withdrawal, this card can be used till there is money available. For every cash withdrawal one will be subject to currency conversion charges, foreign ATM charges or other charges from the bank and/or the local bank that maintains the ATM. Reloading this card is easily possible anytime, anywhere if you run out of money. This can be done over the phone or online or Reload forms that are available for some issuers; one can just go to the agency/bank outlet with the necessary documents and the money and the prepaid card is loaded again. Charges may be applicable for reloading the card as well as on ATM withdrawals, but swiping the card at merchant outlets may not attract charges. Mr. Kusal Roy, Senior General Manager & Head, ICICI Bank, says "These cards are generally enabled with chip and PIN features, making it more secure than other foreign currency instruments like currency notes and traveller's cheques." If out of cash overseas, someone at home can wire money to you and you'll have it within a day or even a few minutes. But you should have account in overseas, so this is normally applicable for NRI, overseas Indian, business people, student's community etc. This card also comes with the benefit of instant replacement of card and emergency cash if the previous card is lost. Some even provides additional benefit of cash back option, insurance cover with air accident insurance, lost card liability etc. Usage of this Travel prepaid Card should be in strict accordance with the regulations of the Reserve Bank of India and FEMA regulations. Amount loaded or reloaded on the card can be done as per the foreign Exchange Management Act, 1999 and prevailing RBI regulations in force at present. Mobile Wallets With technology shaping up our lifestyle, mobile wallets have contributed a lot in that process. To add to it more, with Paytm wallet Uber users can pay for their rides abroad in Indian currency. Paytm will not charge any conversion fee other than the basic foreign exchange rates for. International debit and credit cards As always said, it is highly suggested not to use debit or credit cards abroad for the higher rate of interest charged but nevertheless carrying and having access to one is the smarter decision. One never knows what kind of situation might arise when in a foreign land, and for emergencies a debit\credit card may come handy. Before using credit card know the charges and exchange rates that are going to be levied with your transaction. Mr. Vijay Jasuja, CEO, SBI Card says, "When making a purchase or a transaction in a foreign country using credit card, they will ask you if you want settlement in foreign currency or Indian, if you opt for Indian rupee, it will be converted and the exchange rate will be charged at the time of conversion, and the machine where you are converting, that acquiring bank will levy you charges which differs from bank to bank, and we the credit providers will not levy anything because we will get dues directly in Indian rupee; secondly if you opt for the foreign country currency at the time of the purchase, after 24-48 hrs the transaction will come for settlement to us, and then the exchange rate will be charged by us at the time of the settlement (by the credit card company)." Sometimes these charges can be to your advantage or it can be to your disadvantage. Also to be on the safer side let your credit card provider know that you are travelling abroad, for credit card companies blocks the card when they sense fraudulent transactions. If you use your debit card to withdraw money abroad around 3.5% is charged as transaction fee. The exchange rate for ATM withdrawals is generally the VISA/MasterCard wholesale exchange rate prevailing at the time of transaction. A Prepaid Forex Card or Multicurrency Travel Card with all its benefits is a hassle free way to carry and spend money abroad, but comparing it with all the different offerings then taking the card that suits you, is advisable as even small differences may result in huge charges.